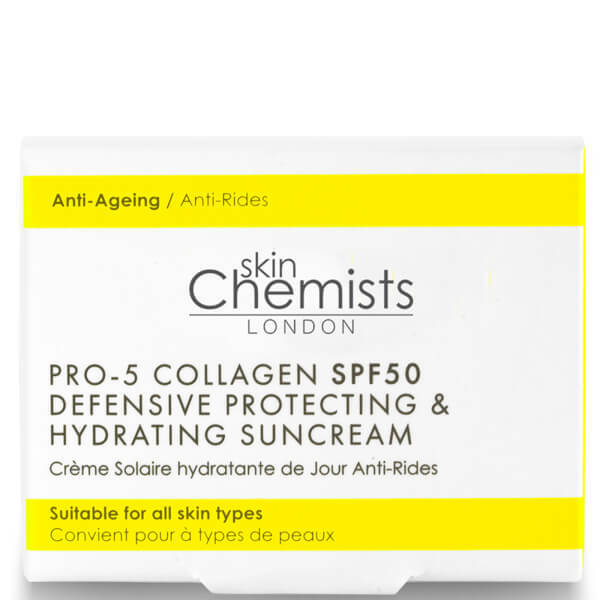 Ensure your skin is always protected with the Pro-5 Collagen SPF50 Defensive Anti-Ageing Protecting Hydrating Sun Cream from skinChemists London. 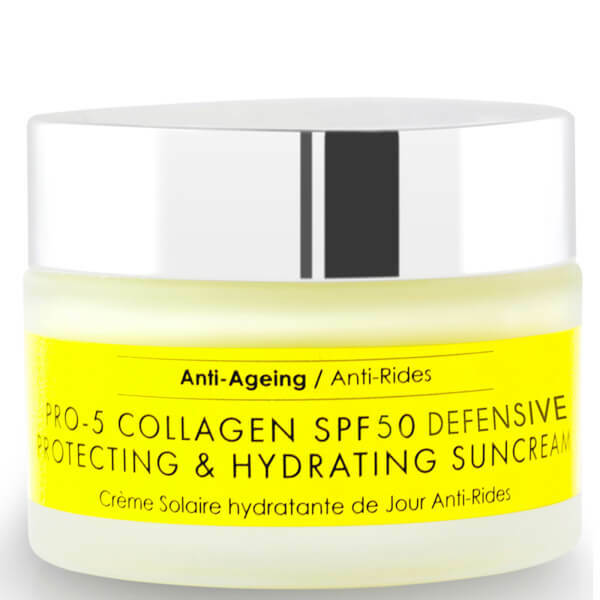 Suitable for use as a daily moisturiser under makeup, the lightweight sunscreen provides a defence against damaging UV rays and free radicals while also offering visible anti-ageing benefits. Shea Butter softens and smooths the skin texture, Collasurge hydrates and Collageneer firms for a lifted, younger-looking complexion. 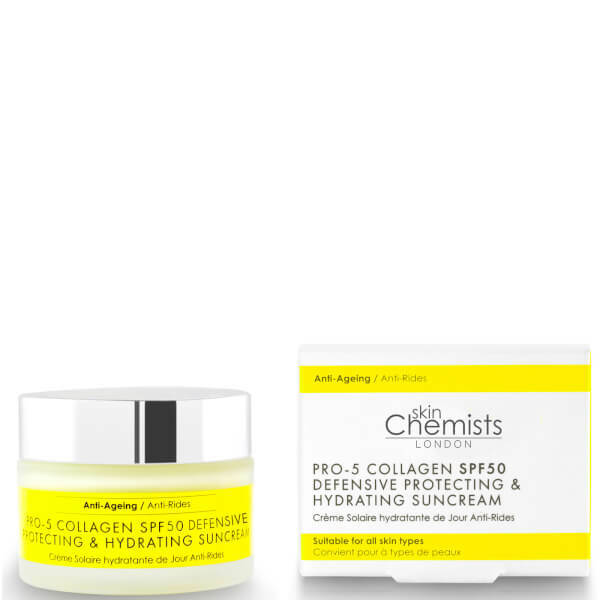 Instantly hydrating and brightening, the formula promotes youthful, radiant skin that is strengthened against environmental damage. 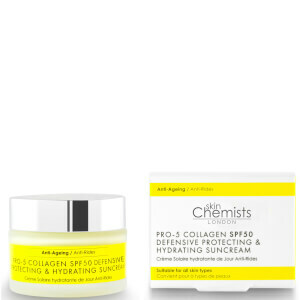 Aqua (Water), Octocrylene, Ethylhexyl Methoxycinnamate, Benzophenone-3, Butyrospermum Parkii (Shea) Butter, Butyl Methoxydibenzoylmethane, Glycerin, Butylene Glycol, Acacia Decurrens/Jojoba/Sunflower Seed Wax/Polyglyceryl-3 Esters, Tapioca Starch, Phenoxyethanol, Caprylic/Capric Triglyceride, Cyclopentasiloxane, Glyceryl Stearate SE, Stearic Acid, Benzyl Alcohol, Sodium Stearoyl Glutamate, Polyacrylamide, Xanthan Gum, Collagen Amino Acids, Lecithin, Parfum (Fragrance), C13-14 Isoparaffin, Disodium EDTA, Theobroma Cacao (Cocoa) Seed Butter, Helianthus Annuus (Sunflower) Seed Oil, Dehydroacetic Acid, Benzyl Salicylate, Polymethylsilsesquioxane, Laureth-7, Hexyl Cinnamal, Limonene, Lupinus Albus Seed Extract, Ethylhexylglycerin, Potassium Sorbate, Citric Acid, Tocopherol.